Banksy is the world's foremost graffiti artist, his work adorning streets, walls and bridges across nations and continents. His stencil designs are instantly recognizable and disturbingly precise in their social and political commentary, flavoured with subtle humour and self-awareness. More popular than ever, Banksy has spawned countless imitators, students and fans alike, his fame - although unlooked-for - inevitably transmitting his ideas and work to the international arena. With a range of topics for the graffiti lover, coming from a variety of inspirational sources, this book provides an overview of how Banksy's work is changing the face of modern art - as well as the urban landscape. 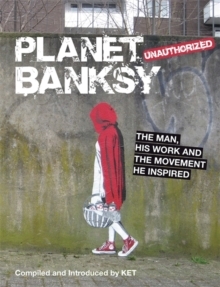 Distilling his influence and his genius into an easily accessible full-colour 128 pages, this is the perfect purchase for any fan of Banksy or the graffiti art scene.